Marti is available to speak for your Seattle area event, online podcast or video interview. Marti MacEwan, MA, is an excellent trainer and speaker. Every presentation is energetic, informative, entertaining, and concretely useful, demonstrates the immediate effects of her original approach to personal performance – and life. Marti is available for one-time speaking engagements, break-outs, a one-day training or a training series for your company or organization. Marti will speak to your association, organization, management team, sales team, sports team, band, staff, cast members, musicians, or any other kind of group. about getting over any reticence, tension or fear and maximizing positive, cohesive energy, so they can perform their best together and reap the rewards. 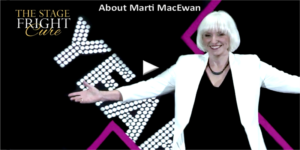 Marti MacEwan is a long time professional counselor, coach and Seattle speaker. Because of the privilege of knowing thousands of individuals and relationships in her private practice, her depth of wisdom and inspiration is extensive. thought-provoking universal messages that apply to each and every audience and each and every aspect of our lives. Marti’s message isn’t limited to stage fright or even optimal performance. She has a more universal and profound message to deliver. She uses each topic as a jumping off point and a metaphor and inspiration for life. In a delightfully human way, Marti shows us how we can eliminate reactions that limit us in any situation, so we can transform our career, business and personal relationships, love, artistic endeavors and play. Marti will show you, and your audience, how. Contact Seattle speaker, Marti MacEwan for speaking engagements or a training series for audiences large and small. Call 206-362-8167 or Email: marti@stagefright.com.